With just a few lines of code, this script will look for an OS X/macOS user's default Safari and Chrome local history files (Firefox requires a clever solution I haven't thought of yet). It then digs through the history to find the time of visit for websites and calculates the day of the week it was on. Then, the program simply plots the results as a bar graph. I was very surprised by the results and haven't thought much about what it says about me. Perhaps I load more pages earlier in the week and then work through them. Or, maybe I spend more time catching up on other non-browser related work or learning later in the week. 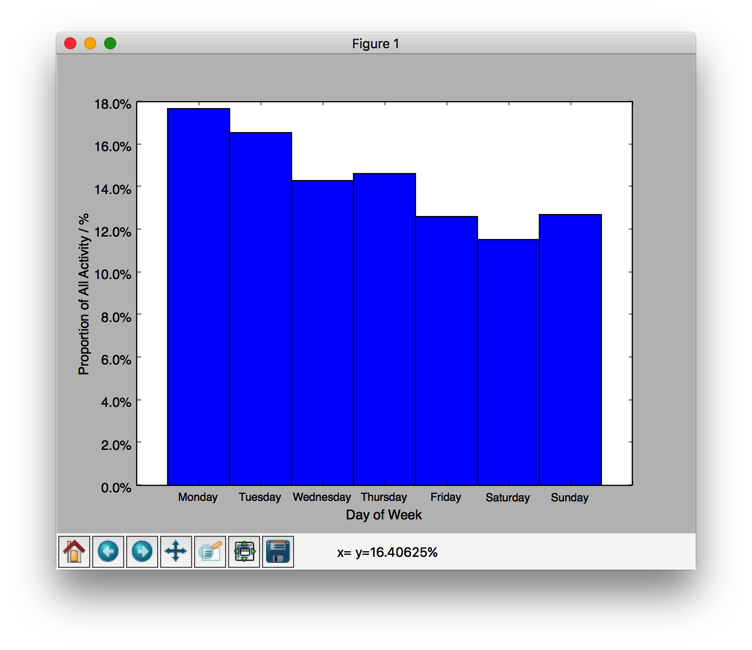 If you'd like to try it yourself, the project is hosted open source on GitHub: BrowserActivity_DayofWeek. I'm also looking for help to bring this to Firefox, Windows, and add some other features like filtering out some websites or changing the time of analysis. GitHub is a little hard to understand at first so please feel free to let me know if you'd like any help! I still want to do another project to process and visualize wind direction data because I swear the wind always blows against me when I am biking. I'm an engineering student living in the future. I care about dreaming big, finding truths, and building equity into our society.